At times this story was so creepy and suspenseful, I found myself wishing it was over with just to know what happened to the main characters! A total nail biter. The ending was a little anti climactic for me after all the build up, but still worth a listen. Yes. I loved the narration, and it gave me a new perspective on the hardships endured during WWII. The dual storylines of the two sisters. Have you listened to any of Polly Stone’s other performances before? How does this one compare? This is my first Polly Stone performance, though I enjoyed it quite a bit. 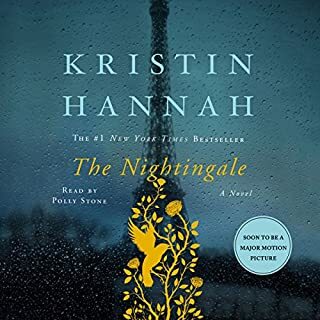 If you could rename The Nightingale, what would you call it? I think the title is appropriate - it was great to learn its relevance as the story progressed. This is a sad and powerful interpretation of what I think is a lesser-known story from WWII. Christopher Snow is the best-known resident of 12,000-strong Moonlight Bay, California. This is because 28-year-old Chris has xeroderma pigmentosum (XP), a light-sensitivity so severe that he cannot leave his house in daylight, cannot enter a normally-lit room, cannot sit at a computer. Had high hopes based on reviews, but this story took too long to get to the point - and not in a suspenseful way. 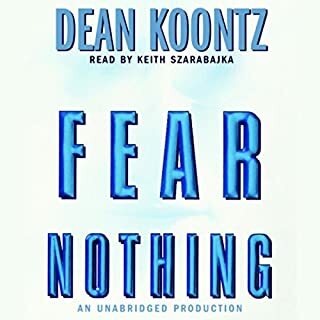 I felt like the plot was very matter-of-fact without the usual twists and turns I expect from Dean Koontz. Dr. Eric Parrish is the chief of the psychiatric unit at Havemeyer General Hospital outside of Philadelphia. Recently separated from his wife, Alice, he is doing his best as a single dad to his seven-year-old daughter, Hannah. His work seems to be going better than his homelife, however. His unit at the hospital has just been named number two in the country and, Eric has a devoted staff of doctors and nurses who are as caring as he is. But when he takes on a new patient, Eric's entire world begins to crumble. There were too many sub-plots! The author spent so much time on the main character's custody issues and other plotlines that really had nothing to do with the main story. Not sure but probably not anything by this author or narrator. His tone was too clinical/formal at times. 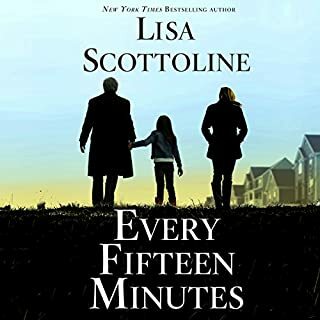 What character would you cut from Every Fifteen Minutes? The ex wife. As mentioned above, that plotline was hardly important enough to the main story and could have been used as general context, rather than a huge aspect of the book. I wouldn't use a credit on this book. Even the attempt at a "surprise" ending was halfhearted at best! In The Silent Sister, Riley MacPherson has spent her entire life believing that her older sister Lisa committed suicide as a teenager. Now, over twenty years later, her father has passed away and she's in New Bern, North Carolina cleaning out his house when she finds evidence to the contrary. Lisa is alive. Alive and living under a new identity. But why exactly was she on the run all those years ago, and what secrets are being kept now? 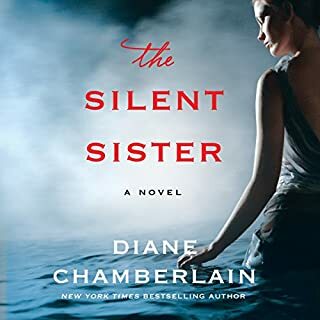 What would have made The Silent Sister better? The plot had more valleys than peaks. It took a while for the major plot twists to come together into a fully-formed story. I wanted to finish the book to see what happened, but I didn't feel vested in the story or the characters. What could Diane Chamberlain have done to make this a more enjoyable book for you? Make the plot twists more dramatic. I felt like many of the main points of the story were casually dropped in and didn't connect to the main plot. Would you be willing to try another one of Susan Bennett’s performances? Unfortunately, no. Her tone reminded me of a whiny Sally Field, and she took a lot of unnecessary pauses. It wasn't bad enough for me to request a refund on my credit, but I'd hardly call this a compelling story. Would not recommend to a friend. I had no expectations going into this story - I randomly selected it from a list of bestsellers. 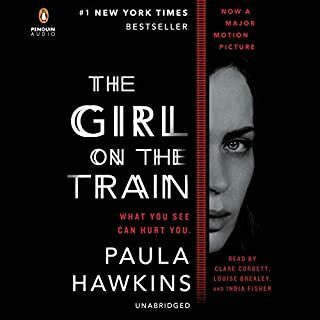 As far as mysteries/thrillers go, it's pretty solid. The story kept me guessing and had enough variation in the narration to sustain my interest. 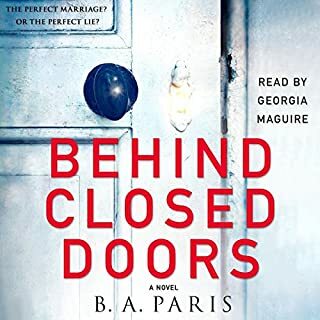 I don't understand the comparisons to Gone Girl (and wouldn't make that comparison myself), but if you enjoy murder mysteries this is worth a listen. Refusing to believe that she would be abandoned as a young child, Jenna searches for her mother regularly online and pores over the pages of Alice's old journals. A scientist who studied grief among elephants, Alice wrote mostly of her research among the animals she loved, yet Jenna hopes the entries will provide a clue to her mother’s whereabouts. Desperate to find the truth, Jenna enlists two unlikely allies in her quest. Probably not. The huge amount of detail about elephants and elephant grief sort of derailed the main story, and the plot twist at the end was almost exactly like that of a well known movie. I won't say which one to avoid spoilers, but once you listen....you'll know. 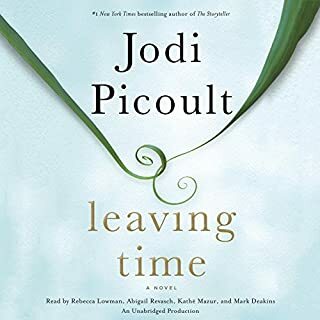 Would you be willing to try another book from Jodi Picoult? Why or why not? Yes. I'm already a fan of hers and sad this one was just average. Yes - both were slowwwwww. I love Rebecca Lowman, but even she was ultra slow here. All in all the story and narration dragged for me. Could you see Leaving Time being made into a movie or a TV series? Who should the stars be? No, as I said, a movie with a similar plot twist has already been made! Not my favorite book from Picoult. If you could sum up Yes Please in three words, what would they be? What other book might you compare Yes Please to and why? Bossypants is the obvious choice because of Amy's connection to Tina Fey (as well as their similar writing styles). However, Amy takes a tone all her own and shares some wonderful excerpts from her past, along with her random (and often hilarious) musings on life. I loved how Amy invited various guests (ranging from her parents to fellow actors) to "perform" with her. It added a new level of intimacy and entertainment to the book - not something that would be felt in a paper edition. It made me laugh hysterically and yes, I even shed a tear here and there - especially as Amy talked about various members of her family. 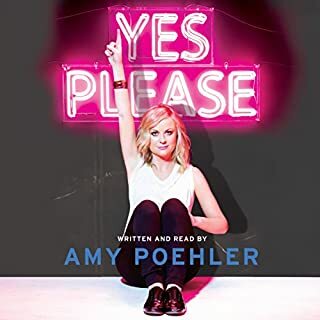 A great listen and a fun way to learn more about Amy Poehler's long and impressive career in comedy. Alice Love is 29, crazy about her husband, and pregnant with her first child. So imagine Alice’s surprise when she comes to on the floor of a gym and is whisked off to the hospital, where she discovers the honeymoon is truly over - she’s getting divorced, she has three kids, and she’s actually 39 years old. 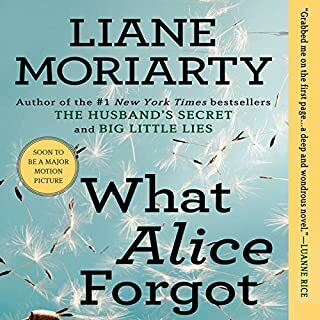 Alice must reconstruct the events of a lost decade and find out whether it’s possible to reconstruct her life at the same time. Yes - I loved the premise and the overall storyline. I found myself wondering what I might "forget" if put in a similar situation. My only complaint is that the ending seemed a bit too rushed/contrived - I was left wanting a bit more. What was one of the most memorable moments of What Alice Forgot? As Alice regains her memories, it's heartbreaking to watch her forget the joy she experienced during the time of her head injury. How quickly those simple pleasures and loving moments are cast aside for the standard resentments and anger. When Alice, Nick and Madison see the humpback whales - it's a time where they all forget their respective issues and anger, and just enjoy being together. 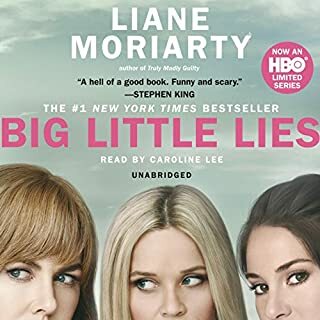 If you could sum up Big Little Lies in three words, what would they be? Though the story is fairly simple, it shows the dangers of rumors and conjecture in a small community. We've probably all been in situations where someone unfairly judged us, or our kids. This book shows that the consequences of such behavior can be far reaching. My first time with Caroline Lee, but I enjoyed her narration and will seek her out again.